Why do simple everyday sights sometimes produce feelings of crushing melancholy? 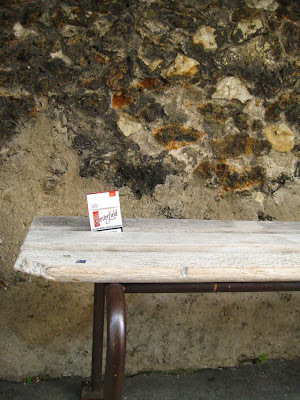 Walking past the visitor's entrance to the Prison de la Santé on a cold, silent Sunday afternoon, my guts are sent churning by an empty packet of cigarettes abandoned on a stark bench outside. It’s easy to imagine the last cigarette of the packet being smoked here, the final spark of warmth and comfort before the pain to come. This is a harsh environment that would feel cold even in the heat of summer, but on this winter day I can imagine the hand holding the cigarette shaking, the visitor not sure if it's because of the chill in the air or because of their shredded nerves. Why are they here? A sense of obligation to a wayward family member who now only provokes dread, or to grasp short minutes with a desperately missed loved one? Either way, the reunion and subsequent separation will add one more scar to the heart. The visitors see what is behind these high, thick walls and know what happens on the other side of the locked doors beyond. I can only imagine. 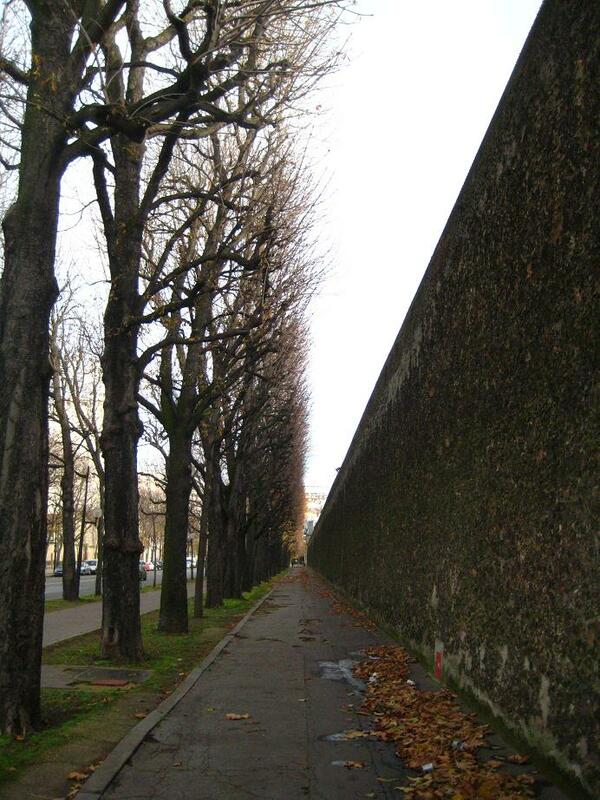 These are walls that were built in 1867, and now represent the last remaining prison within the boundaries of the city of Paris. Originally designed as a model penitentiary, a cleaner, healthier, more humane way to treat prisoners, it has become one of the final traces of Zola-esque squalor in the city. From the outside we see only the dullest stone and tiny barred windows, but it is easy to believe the tales of four-to-a-cell and skin diseases that have not been seen elsewhere in the city for sixty years. Even on a sunny day, the whole area here seems to sit under a cloud of darkness. The sun sets early, hidden behind the high walls, but even at midday little light penetrates inside the buildings. Once this prison was isolated from the rest of the city and surrounded by fields. Now apartment blocks stand defiantly outside, and prisoners can hear the freedom hum of car engines all day long. In their forced cellblock inertia and immobility, is it comforting for them to see these movements of everyday life, or are these signs of liberty, and the prying, judging eyes around them daily hammer blows to the soul? On the Boulevard Arago, alongside the north wall, the last remaining prison shelters the last remaining vespasienne. 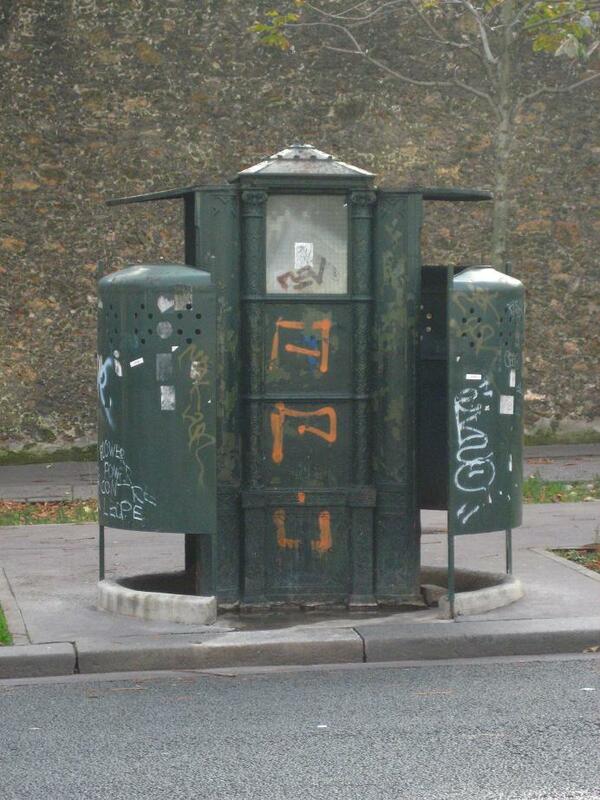 Even the public toilets here come from another age. Once there were 478 of these on the city streets, now they are apparently considered acceptable only for prison visitors. 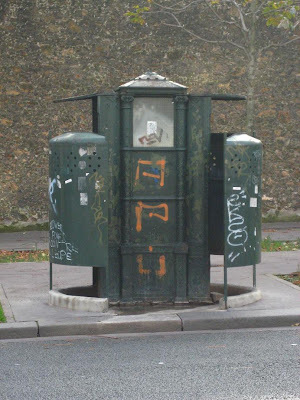 Perhaps it has been left here to draw attention away from a spot 50 metres further on, the position on the corner of the Boulevard and the Rue de la Santé where the guillotine stood until 1940. Around 40 prisoners were executed here in the street, but the killing carried on afterwards behind the walls and away from the eyes of the public. The guillotine was used here for the last time in 1972. 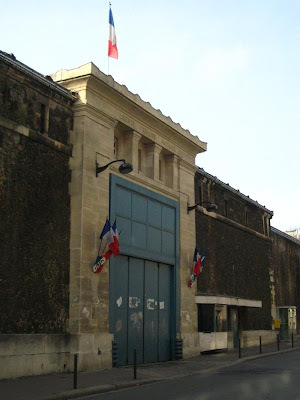 Around the corner on the Rue de la Santé, there is another entrance to the prison. This time it is a little more decorative, a little more welcoming. This is the staff entrance and the entrance of visitors to prisoners in the VIP wing. Rogue politicians and other public faces who took wrong turns are housed here, away from the laws and hierarchies of the ordinary prisoner, protected and probably paying in some way for their privileges. 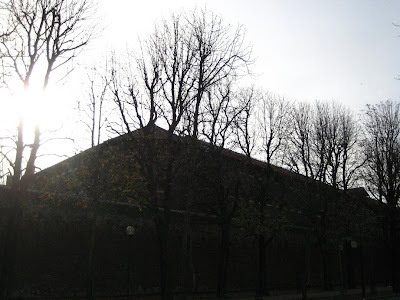 Walking along the Rue Jean Dolent to the south, I’m reminded that city prisons were always designed to be harsh reminders to the person in the street of the fate that awaits law breakers. Such public exhibitions of vengeance are rare today, but this one is still very effective. These are not high, menacing towers, belittling the individual, but instead walls of oppressive claustrophobia in the heart of a city where freedom is taken for granted. Coming back full circle to the packet of cigarettes, the walk has not been a long one. There is still nobody waiting on the benches, nobody here at all in fact. Looking again at the empty packet I can suddenly see why this banality touched me in such a way. We are all a simple slip, an electrical short circuit in the brain, a lightning strike, a dice throw, a bad choice, a moment of inattention away from this spot on the bench. Or worse still, between four narrow walls inside. The name of “Santé” (health) is a bit surprising, but as you may know it comes from the name of the street leading to the Sainte-Anne hospital. Yes, it’s certainly not the best place to take care of your “santé”! I was surprised to read that the guillotine was still in use up unitl 1972. Does France still have the death penalty? Designslinger: The death penalty was abolished in 1981 when François Mitterand became President, but the last execution was in 1977, and it was a rarely used form of punishment. Je me souviens très bien du matin de l'exécution de Bontems et Buffet en 1972. Bontems était simplement reconnu complice d’assassinat. Ce fut la dernière exécution à la Santé. Je me souviens où j’étais lorsque je les ai apprises, comme pour la chute du concorde, l’assassinat de Kennedy ou les premiers pas de l’homme sur la lune. Au bagne en Guyane il y avait deux guillotines, l’une à St Laurent du Maroni, l’autre sur les îles du Salut. Les condamnés attendaient dans leur cellule l’acceptation de Paris, cela prenait du temps. Ensuite les condamnés avait un dernier repas et devaient signer leur levée d’écrou. Et l’exécution avait lieu devant tous les bagnards. Des têtes ont été gardées dans le formol. Quel simulacre que ce rituel ! Bien sûr la mort est une punition définitive et irréversible. Et elle est donnée au nom de la justice encore tous les jours dans le monde. How many reside in that prison? Ken Mac, E: Thanks. It was actually quite difficult to take pictures of this building, firstly because I could feel security cameras twisting round towards me, and could imagine someone inside taking note of this suspicious character outside! Secondly, it's quite tricky to find good angles, as there is little space between the high walls and the apartment blocks that surround them. Around 1500 prisoners can be housed inside I believe, but I think some renovation is finally taking place which will have vastly reduced the numbers - for the moment! Elizabeth - the French legal system terrifies me too! I guess you always feel slightly more in danger in another country, as you may be breaking obscure laws that you didn't even know existed. Afterwards, if you become caught up in that legal system, would you then feel defenceless against the tiny subtleties of language during any subsequent interrogation or trial? Secondly, being imprisoned is one of my greatest fears in life, but in France it seems that it would be particularly bad. The French state is regularly criticised by European institutions for breaking human rights agreements in relation to their prisons, and suicide rates inside are appallingly high. Great post! I've always found the Santé prison interesting for some reason. 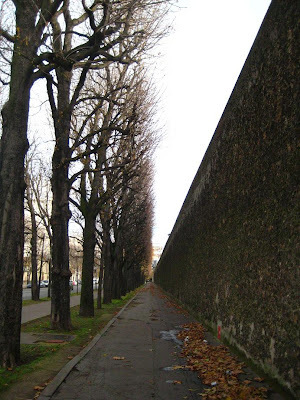 The last time I was in Paris I walked a variation of your route and noticed the plaque on one corner of the wall dedicated to the French who were executed there during World War II, which I found to be quite interesting. I'm also quite interested in the Sainte-Anne hospital, as I stay quite near there on one of my trips to Paris. I also find the French legal system interesting. One my last trip to Paris, I was at Park André Citroën when a pair of police officers came through chasing after a couple of teenagers. Then after handcuffing their targets, they then proceeded to tackle another person who was near by. He was a tourist who had taken a picture of them arresting the others. The guy managed to hand his camera over to a friend, who was then also received the attention of an officer. Gorgeous. That pack of cigarettes is going to stay with me for quite a long time. Comparing prisons seems, some how, impossible. There are only prisons. I do volunteer work inside the largest jail in the world, where, in spite of the good intentions of most of the sheriffs (who serve as guards), I could not imagine surviving as an inmate. In a state with the death penalty, it can seem as if the whole system is a funnel of desperation: clinging/slipping with bleeding fingers, on to the steep sides so as not to fall into that medical chamber of horror. Many of our inmates are primarily mentally ill, now that the social system classifies mental illness as criminal behavior. If it is true, that the prisoning element of society suffers as much as the prisoned, we are working great do-do on ourselves. The French imprison 93 humans out of 100,000. Here in the ol' USA, we imprison 701*. So no matter how much you may fear French law, the chance of it putting you in Santé is very much lower. Justine: Yes, you are not allowed to take photos of the Police, especially when they are arresting someone! Peter: Thanks for your interesting contribution. Yes, being taken out of society and placed behind a locked door is the same everywhere in the world. What interested me here was how this institution is placed right in the centre of the city, so that the prisoners are at once excluded from and at the heart of Paris. Elizabeth: You are innocent until proven guilty in France not the way around. Justine: It is probably to protect the arrested one, especially if he is underage he has right to stay anonymous. The policemen were actually protecting the arrested one. There is definitely a problem with prison in france. Yet I think that european standard are higher than in the US. No uniform, to death penalty, shorter prison time etc. So it's probably hard to make comparisons. I was hoping you would get around to doing a post on this "atmospheric" prison! Growing up in Boston, I used to sail at a club called Community Boating on the Charles River. The subway station closest to the club, Charles St. was in the shadow of the great, gray granite walls of the Charles St. jail. The burger stand at the base of the wall always seemed to emit that slightly greasy, onion smell that I imagined taunted the inmates. Many a minute, waiting for the train, was spent pondering those walls, and wondering how those inside might be faring. I understand the jail has been turned into a hotel now, ironically named The Liberty. Gina: I remembered your picture and I thought of you! Peter: A converted prison called The Liberty! It looks pretty amazing, and you can even eat in a restaurant called 'Clink'! Actually, you can eat inside the cells! any lucky researchers found Manuel Noriega's French prisoner number in La Santé ? 38699-079 and; inmate no. 41586 variously attributed to 'Pineapple Face' in the States of the free . novel research per forthcoming novel, squid into quid . merci beaucoup .